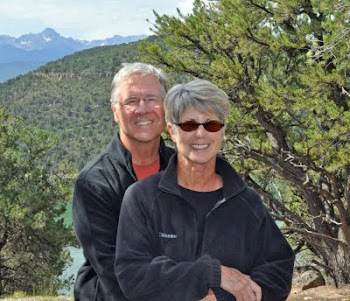 We left our home in Colorado on a bright and sunny Sunday morning, July 7th with both of us looking forward to another adventurous journey on our way to camp host in Glacier National Park again. Our first stop was Medicine Bow – Routt National Forest. Now having lived in Colorado for many, many years it was hard for us to fathom we had never seen this beauty in our neighboring state of Wyoming before. There was still snow, the weather was brisk, the mountains were stunningly beautiful…see why we get excited for adventure? Who knew our first stop would bring us such a treat! Our next stop was Fossil Butte National Monument in Wyoming. Now this place we knew about since we had visited there in 1997…not much had changed except for some new exhibits and a most informative video presentation. Still, the research they do and the discoveries they make are invaluable, referring to the site as an “aquarium in stone”. More pictures here. Typically we like to mosey along with a self-imposed rule of 200 miles or 4 hours of driving – whichever comes first – however today we broke our own rule! There was such enthusiasm in our souls! We had a long day of driving and sightseeing and were happy to arrive at Bear Lake State Park in Utah. The lake is so large it actually goes into Idaho. Again, this was a return visit however this time we decided to stay a few days and check out the surrounding areas. Just a little FYI here – we had a full-hook up site #1 in the Birch Campground. We loved, loved it as we were separated from the masses, and the bugs along the water. The water by the way is a gorgeous turquoise blue color. More pictures here. The next day we drove around the area and ventured into the city of Paris, ID. The settlers thought they had found a home in Utah, however in 1872 after a boundary survey, they were told they were actually in Idaho. Can you imagine? We had lunch at the charming and oh so yummy Paris Café. The café is right across the street from the imposing Paris Tabernacle. Wow! What an astonishing, historic place! Erected in 1888 it is a beautiful structure. You can take a free tour at any time of the day they are open. Leaving on Wednesday, we set our sights on City of Rocks National Reserve in Idaho. This charming park in located in the tiny, historic town of Almo, ID. Now I say a “charming park”, but it really is a world class rock climbing destination for enthusiasts from all over the world rivaling Yosemite National Park as a western favorite for technical rock climbing. In addition to the rock climbing, and its’ geological wonders, it was a point for emigrants on the California Trail to stop - rest and write their names in axle grease on some of the rock faces. Whenever I see names carved or written on rocks from the 1840’s to 1880’s, I am always in admiration of the tenacity and strength of our pioneers. More pictures here. So now we are packing up camp and heading towards our final destination at Glacier National Park. Who knows what tomorrow will bring along the way, but I can say…we are excited to find out.